Review of Perfect Chemistry by Simone Elekeles | What YA Reading? At Fairfield High School, on the outskirts of Chicago, everyone knows that south siders and north siders aren’t exactly compatible elements. So when head cheerleader Brittany Ellis and gang member Alex Fuentes are forced to be lab partners in chemisrty class, the results are bound to be explosive. But neither teen is prepared for the most surprising chemical reaction of all– love. Can they break through the stereotypes and misconceptions that threaten to keep them apart? Brittany flashes me a triumphant smile, thinking she’s won this round. Guess again, gringa. Dream Works has done it. But Elkeles does it better. Brittany Ellis is perfect. Alex Funetes is a gangbanger. Brittany is a spoiled little rich girl. Alex struggles to help his mother put food on the table. Brittany hates Alex. Alex hates Brittany. They both hate chemistry class. So why do they have… chemistry? When the high school’s princess and the Latino Blood gang member are thrown together by their chemistry teacher, who arranges lab partners alphabetically, things do not go well. They fight and insult each other and judge each other based on their own biases. Their chemistry is far from perfect… but when someone bets Alex his prized motorcycle that he can’t seduce Brittany in a couple of months, Alex makes it perfect. In his efforts to entice Brittany, Alex unintentionally gets to know her. And the girl he gets to know is a far cry from the perfect princess Brittany pretends to be. The girl he gets to know has an aggressive mother who throws fits whenever things go wrong in the Ellis household. The girl he gets to know’s number one priority isn’t her hair and makeup, it’s her mentally-challenged sister, whom her parents treat like dirt. The girl he gets to know maybe doesn’t want to be perfect anymore. Brittany quickly unearths the real Alex, too. The real Alex who only joined a gang to protect his family, longs to go to college even though he knows that that future is impossible and far-fetched, and who’s life mission is to give his brothers the future that he could never have. A relationship between Brittany and Alex is , of course, social suicide. Brittany rejects Alex so many times that I’m surprised he doesn’t give up on her. But when Alex challenges Brittany to get real, she surprises everybody… and gets real. The thing I love most about Perfect Chemistry is the stereotypes. There’s the Latino hunk who’s in a gang, and the blue-eyed blond-haired princess who’s the captain of the cheerleading team. But the characters are so much more than that! They go beyond the superficiality of the classic bad-boy-meets-good-girl YA plot line. They prove to readers that, sure, high school is about images and reputations and living up to them, but it’s also about individuality. Perfect Chemistry challenges the high school scene, and I love that. I equally enjoyed the rotating points of view. I’m usually not a fan of this, mainly because I prefer reading books that are written in the first person, and if the point of view switches, the book is generally written in the second person. However, Perfect Chemistry switches the point of view from chapter to chapter, Brittany to Alex, in the first person. I like this concept and I can see how it was necessary to Perfect Chemistry‘s plot so you could peek into the thoughts and motives of the two main characters and truly understand them. This book also contains many Random Acts of Kindness. This surprised me, because usually in YA books, if the characters’ lives are going badly, they are going badly. Authors frequently refuse to admit that the entire world cannot possibly be against one character. But Elkeles does, and the result is very pleasant. I am likewise glad that when Alex and Brittany admit their feelings toward each other to their friends, not all of their friends abandon them. This shows a realistic loyalty and proves that North siders and South siders aren’t all that different. The plot twist towards the end of Perfect Chemistry had my eyes welling up. I did not predict it at all and could barely believe the circumstances. It’s just so unfair! This was definitively hard to read… but without this scene, this book would have been unrealistic and watered-down. So I thank Simone Elkeles for Perfect Chemistry‘s authenticity. If the epilogue of this novel were compared to a food, it would be canned cheese. Super corny and cheesy and eye-roll-inducing… but perfect in its own way. Here’s the book trailer. It had me laughing so hard, I just needed to share it with you guys. It’s Simone Elkeles’s parody of her own book… so funny. All in all, Perfect Chemistry is a must-read. Riveting from the first chapter and a great twist on the classic tale. 4.7/5 stars. 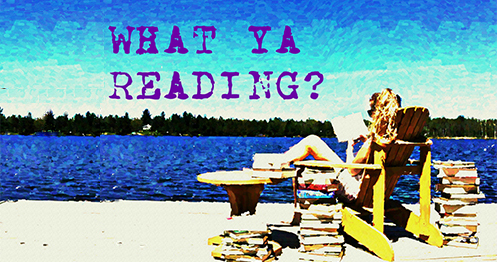 Pingback: The Immortal Rules | What YA Reading?